Today’s post is simply a brief recommendation to check out (and sign up) for Eat Drink Lucky, the Portland, Maine edition. A few months ago, I discovered them on Twitter and signed up for their free, daily e-newsletter. Given Portland’s status as a foodie city, it seemed like a wise way to stay in touch with Portland’s exciting culinary ventures when I’m far away. Jealousy aside, I’ve enjoyed every edition. The newsletter is cleverly written, brief, and regularly introduces me to, or reminds me of, fun cultural events and dining (or drinking) opportunities. For example, I was inspired to post about them today specifically by their “Drink” section, which clued me into Rosemont Market’s three wine tastings this week (and next) that will be geared toward helping you select the perfect Thanksgiving pairing. Categories: Drink, Eat, Shop | Tags: Eat Drink Lucky, Maine, Portland, Rosemont Market, Thanksgiving, wine | Permalink. It hit the 30s in Macon, Georgia this past weekend. It snowed in parts of South Carolina and northern Georgia. And, quite simply, cold and snow makes me crave chili – spicy and hot, so it warms inside to out. And thus I began the chili recipe search. I enjoy chili, and so does Nick, so I make it fairly often. It’s my favorite use of leftovers when we smoke a beef brisket, for example. I refer time and again to the recipe for Leslie’s Chili, which is still my go-to beef chili recipe. Chili is a double-win as a cost-effective, two-night plus meal for the two of us. This early cold snap presented the perfect opportunity to try some type of white chili, using either chicken or ground turkey. I found Liz’s White Chicken Chili on page 61 of Recipes from the Maine Kitchen. Heat oil in large skillet and cook chicken approximately 5 minutes. Remove with slotted spoon and set aside in a bowl. Cook the onion and garlic in the pan juices for about two minutes, then stir in the chicken broth, chiles, and spices. Simmer uncovered for 30 minutes. Stir in chicken and beans and simmer for another 10-15 minutes. This recipe really is as easy and (relatively) quick as it sounds. If you want to punch up the spice, which I did, simply add more of the cumin and other spices. I also threw in some fresh, diced jalapenos from our garden, and a bit of cayenne pepper. 1) poach and shred the chicken. I think having shredded chicken throughout would have enhanced the flavor and the texture. 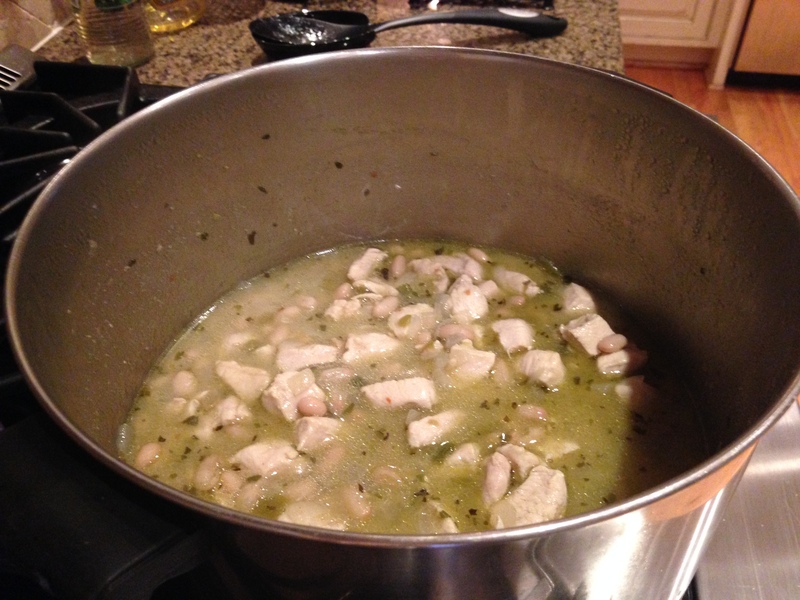 You also may be able to enhance the flavor by poaching the chicken in a mix of water and white wine, with seasonings. 2) add other veggies. I’ve made beef chili before that calls for diced carrots and other unique vegetable additions. I think that would work well in this dish, too, and add more interesting flavors. 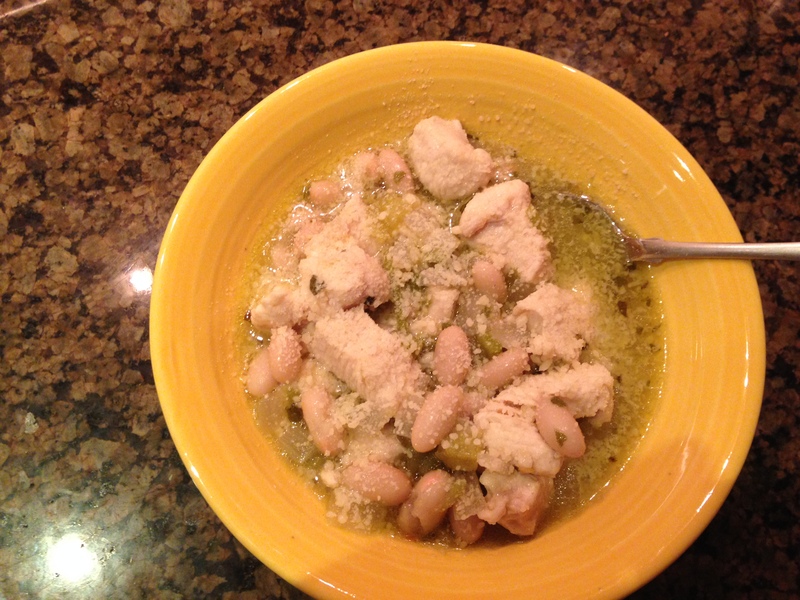 If you like white chili (and let’s face it, chicken is better for us than red meat), I’m sure you will like this recipe. I’ll keep you all posted on round 2 and if my revisions work well! 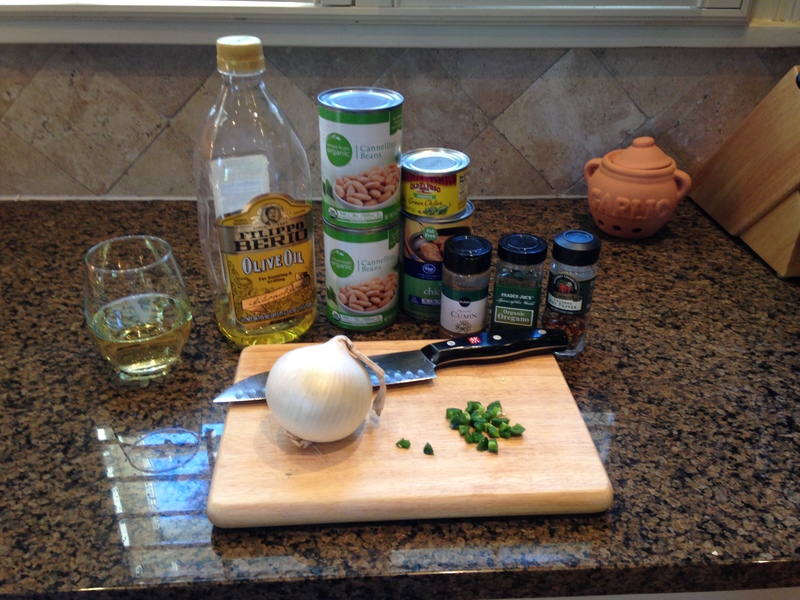 Categories: Eat, Weekly Recipe | Tags: Maine Home Cooking, weekly recipe, white chicken chili | Permalink. Portland Beer Week, a week-long series of events celebrating (and organized by) Maine’s craft beer industry and providing both education and appreciation opportunities, kicked off yesterday and runs through this Friday, November 7th. My misfortune is that my next visit to Maine is next week – but for the rest of you, there’s no excuse for missing out on this opportunity to enjoy a good brew and support those local businesses that are the backbone of the great state of Maine. On a playful note, this year, the local breweries are crafting specialty beers in honor of Bill Murray – see more at this link for Bill Murray Beer Week. Nationally, craft brewing has exploded over the last several years. Virtually all states and citizens have capitalized on and benefited from this trend and the increase in quality beer options, although some certainly more than others. The entrepreneurial, artistic climate in Maine naturally lends itself to take advantage of this momentum, and there is no question that this boom has been a boon to Maine breweries. Although the big craft beer movement is recent, when I think of craft beer in Maine, I’m taken more than 20 years back in time, to visits to Gritty McDuff’s as a little girl (where, not to worry, my dad might have enjoyed a brew or two, but I did not). Gritty’s was founded in 1988 and their long tenure in Portland and expansion to Freeport and Auburn locations is representative of the history of Maine craft beer. Other breweries come to mind, too, like Sebago Brewing (founded 1998) and the well-known Allagash (founded 1995). I’m sure a Maine beer expert could name a number of other older breweries, as well. Whether they are old (mature?) and storied or new and unique, Maine’s craft breweries offer something for everyone and are sure to satisfy. Get out there and enjoy! 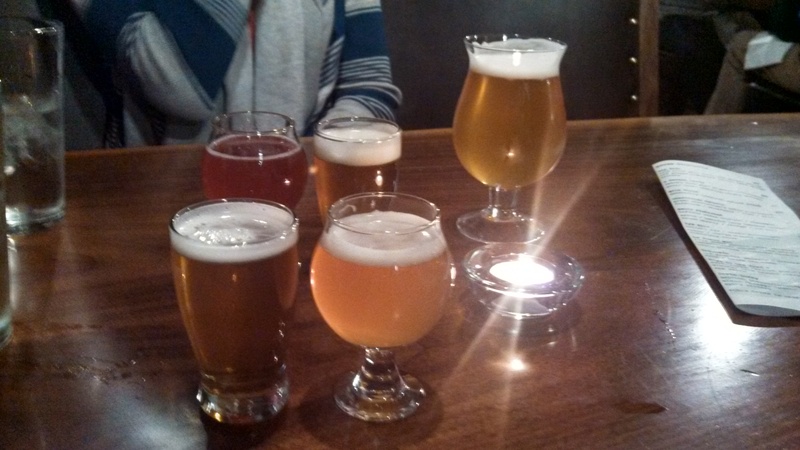 Categories: Drink, Play | Tags: brewing, craft beer, Maine, Portland Beer Week | Permalink.